Chasing is an instinctive behavior in dogs. Dogs love chasing cats, joggers, bicycles, cars, other dogs and almost anything that moves. Moving objects stimulate dogs to chase. If your dog is a herding breed, then your dog's nature to herd the moving object is even greater. Often the dog's predatory nature is stimulated and causes the dog to chase. Sometimes it is just the dog's play response. Dogs love to chase and be chased. Until you have learned to control your dog's chasing instinct, do not let him off-leash. It's dangerous for him and the person or animal he is chasing. Before exposing your dog to a situation where he will want to chase, you must train him in a controlled setting. 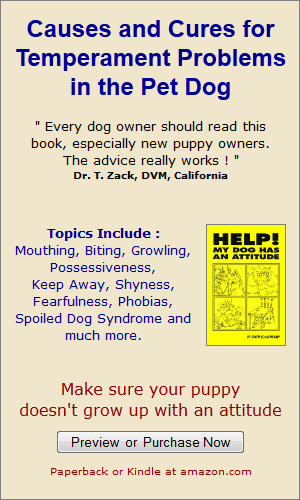 It is important that you set up a situation where your dog can concentrate and understand the behavior you want. He must have the opportunity to perform the correct behavior repeatedly since up until now he has probably only had practice misbehaving. Start the training session indoors in your own home. Put your dog on leash and stand with him at one end of a room or hallway. Wave a tennis ball in front of him but don't allow him to touch it. Now, roll or toss it across the room or down the hall and tell him 'OFF.' If he starts to go after it, command 'OFF!' and give him a firm tug on the leash. It's extremely important that you do not allow him to touch the ball or he will think that the word 'OFF' means for him to chase and get the ball. We are not trying to teach the dog to fetch. Practice this several times a day until he gets the message that 'OFF' means: don't go after the ball, i.e. : don't chase. When he gets it right, praise him profusely and give him a special treat. When he seems to understand this new 'game,' repeat it in different rooms of your house. Practice in the garage and in your back yard. When it's clear to you that he really understands the meaning of 'OFF,' then try it without holding onto his leash. Leave his leash on, dragging on the floor so you can grab it or step on it quickly should he forget what 'OFF' means. When he has mastered this, try it completely off-leash, but still in your own home and yard. Now it's time to practice with a jogger. Enlist the help of a friend to pose as a jogger. Stand with your dog on leash and have your friend jog by repeatedly while you repeat the 'OFF' exercise as you did with the tennis ball. Be sure your dog performs perfectly on leash before you try this off-leash. If your dog is chasing cars, ask your friend to meet you on a quiet, secluded street to help you train your dog. Again, repeat the 'OFF' exercise as your friend repeatedly drives by. Be sure your dog is perfect on-leash before you try it off-leash. It's important that you practice this in a set-up situation. You must know that the driver is aware of the training so he/she can stop the car should you lose control. By now you should have some degree of confidence that your dog will obey because of the hours of practice and his level of performance in the staged situations. Always use good judgment. If the real situation seems too tempting, too distracting or too stressful, don't ask your dog to perform miracles. Practice with him daily and with every opportunity that arises. Praise him profusely every time you say 'OFF' and he obeys. If he disobeys, give a strong tug on his leash, command 'OFF!' and realize he needs more training. Don't wait until your dog is in full chase before doing something. Success is most likely when you use 'OFF' as a preventative command. If your dog has a strong predisposition to chase, it is your responsibility to be alert for his safety and others. If you feel you cannot pay attention to the environment around you when you're with the dog, simply do not let him off leash.